I purchased a house late this summer with a great double deck leading up to my pool. I realized quickly that even though the deck is large enough to accommodate two patio tables, with my big extended family, seating was going to be a problem. In addition, the sound is directly across the street from my home and from the one end of the deck I have a beautiful water view. I came up with this very inexpensive idea for additional seating on my deck. It is so simple. 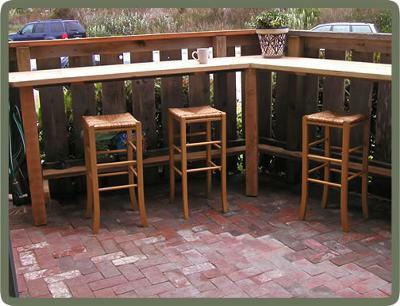 We are just adding a self (bar) just under the rail and adding some inexpensive stools. Voila'... instant extra seating that doesn't take any of my deck space away. Bonus to me, I can sit and drink my coffee in the morning and look right out over the water.